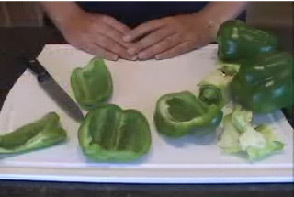 RecipeTips.com's video demonstration on how to core and slice a bell pepper. For more cooking tips and advice visit RecipeTips.com. Today I am going to demonstrate how to core and slice a pepper. To begin with, place your pepper on a cutting board. Begin slicing lengthwise down the pepper around the core on all four sides. The next step is to remove the seeds and ribs from each section. Once the seeds and ribs have been removed from each section, they are ready to slice into long strips. Use your knife and slice the strips into whatever thickness you desire. If your recipe calls for diced pepper, place the strips together and dice them to your desired size. For more information on peppers and other garden vegetables, visit www. Recipetips.com.